Forecast for today is low 40s and sunny. 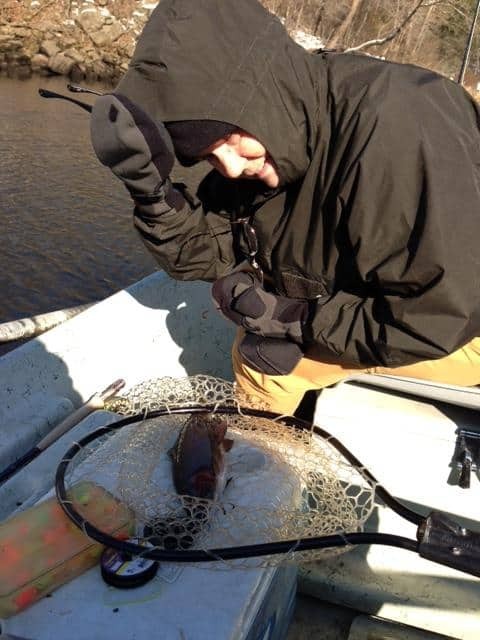 If you’re in the area…..get out and fish! Tomorrow MAY be a little different scenario. Right now it looks like upper 30s but ice changing to rain. If we have to have moisture, let’s hope it is rain. Saturday looks pretty good with slim chances of moisture and upper 30s. From Sunday on into next week, we are looking at some nice temperatures from upper 40s into low 50s. Just need to get through tomorrow! Generation schedule is starting to look wader friendly again. No generation in the am.m until 6:00-7:00 a.m. then off for 6-7 hours. Back on near dark….when you want to be off the water anyway! Stan on the water yesterday with Bill and Bea from the Kansasa City area. These two walked into the shop yesterday ready to go fishing and fishing they did. Great day for them on the big ruby early (generators on at put-in then dropping) with a black zebra midge dropper. Once the water settled down, it was the primrose & pearl midge. Bea’s hands were too cold to hold her nice rainbow! Several folks out fishing the past few, “cool” days. Reports are good fishing on several patterns. Up near the hatchery, the rea or worm brown San Juan worms are doing well while there is fairly heavy current. Once it drops out, the hot hare nymph did great for Gary yesterday, and one of our other customers caught “a bunch” on a gold beadhead olive wooly bugger. Sounds like we should bundle up and go fishing! This entry was posted on Thursday, December 12th, 2013 at 11:35 am	and is filed under Fishing Reports. You can follow any responses to this entry through the RSS 2.0 feed. You can leave a response, or trackback from your own site.